If you ever wanted to prank your friends, Mom or any relatives with the voice of Bollwood superstar Amitabh Bachchan or kids friends Mickey mouse or bit different voice than here is the good news for you! Tata Indicom leading CDMA Mobile Service Operator today announced launch of India’s first ever prank calling service on any mobile operator as new VAS, that will let you not only “rickroll” your friends, but prank call anyone anywhere! To try out the service TATA Indicom Subscribers need to dial *69 followed by mobile number/landline number and choose from different pitch variants by using 1-9 keys from phone.If subscriber want to come back to normal voice than they can press Zero any time while using this service. So go ached put a smile on someone’s face today! 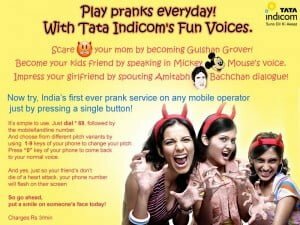 As a call charges Rs.3 per minute will be applicable to use the Tata Indicom fun Voice Prank calling service. achhi service hai,free hoti to mazaa aata..
emad. how do u paste those smileys.